MONTEVIDEO, Uruguay, June 7, 2017 /PRNewswire-HISPANIC PR WIRE/ — The IPv6 protocol, key to the development and growth of the Internet, has reached considerable levels of deployment and traffic in the region over the past year, as IT leaders concluded at the LACNIC 27 event, which brought together more than 735 participants. The IPv6 protocol is the key not only to driving development of the Internet of Things (IoT) in the region, but also constitutes a vital tool for connecting with 40% of the Latin Americans who still have no Internet, emphasized LACNIC President, Warder Maia. LACNIC 27, the most important meeting of Internet professionals from Latin America and the Caribbean, was held in Foz de Iguaçú, Brazil, with the support of NIC.br and CGI.br. Maia emphasized that in 2017, LACNIC is celebrating 15 years of institutional life, and placed special emphasis on the construction of the Regional Internet Register community, which has made possible development of a Web suited to the needs of Latin American and Caribbean users. This year, Latin America and the Caribbean achieved Internet penetration of 59.6%. As per this last figure, the region’s Internet community now stands at 385 million users, incorporating 40 million new ones in the past year. “It’s a reason for pride, and at the same time a double challenge, because we have to connect those who are not connected, while keeping on the Web those who are already there,” said Maia. During the event, emerging technological trends were addressed, and their impact on the future development of the Internet in the coming decade in the panel, “The Internet of the future: its evolution in the next 10 years.” Moderated by Oscar Robles (CEO of LACNIC), the panel featured the participation of Adiel Akplogan (ICANN), Christine Hoepers (CGI.br), Flavio Amaral (Netflix) and Matías Quintanilla (Telefónica Argentina). Furthermore, for the first time at a LACNIC gathering, ICANN CEO Göran Marby made an appearance, and presented “ICANN – after the transition from IANA supervisory functions.” He recognized the digital community’s work and stressed the growth of IPv6 in relation to Latin America and the Caribbean. Out of the event’s five days, one of them was dedicated to IPv6 Day, with a panel of success stories where good practices and examples from the region were presented (Telefónica Brasil, COPEL, ANTEL de Uruguay and Telecentro Argentina). Another highlight of LACNIC 27 was a presentation by the region’s first anti-abuse group, an initiative to strengthen the fight against online threats. Meanwhile, LACNIC’s inclination towards greater participation by women in IT in Latin America and the Caribbean was reflected in the heavy attendance at the panel on diversity and inclusion. Organized by the discussion list ‘IT Woman,’ the initiative sought to strengthen regional women’s role in the Internet community. FOZ DO IGUAÇU, Brazil, May 23, 2017 /PRNewswire-HISPANIC PR WIRE/ — The promotion of integrated efforts at developing the Internet in Latin America and the Caribbean was prominently underscored during the first day of sessions of the meeting LACNIC 27, being held May 22-26 in Foz do Iguaçu. The opening session featured Ariel Graizer (LAC-IX), Eduardo Santoyo (LACTLD), Demi Getschko (NIC.br), Hartmut Glaser (CGI.br), and Wardner Maia (LACNIC). “Given the overwhelming interest, registration had to be closed two weeks before the start,” said Maia. More than 650 people were in attendance, not including the 420 attending from a distance. The session also included a welcome by LACNIC’s president to the first woman to serve as co-moderator of the LACNIC Public Policy Forum, Paola Pérez. Demi Getschko stressed the importance of being able to contribute as a co-organizer of the debates generated at LACNIC events. “Several challenges in the Internet space have caused concern, including attacks, regulations and neutrality. It is, therefore, important for us to remain vigilant of aspects such as these that can affect the Internet as a whole,” he explained. Harmut Glaser reminded everyone that “this week, the Internet’s headquarters in Latin America and the Caribbean is Foz do Iguaçu.” Certain topics of special interest to the region, such as IPv6 growth and local traffic exchange, were also highlighted. The panel on the “Internet of the Future: Its Evolution over the Next 10 Years” was moderated by Oscar Robles, Executive Director of LACNIC, and included members Adiel Akplogan (ICANN), Cristine Hoepers (CERT.br), Flavio Amaral (Netflix) and Matías Quintanilla (Telefónica Argentina). Cristine addressed concerns such as security, stating that these should not focus solely on an attack response, but also implementation of good practices that do not increase the contribution of devices and networks with attacks. Adiel underscored the need to consider privacy at every level of the network. Flavio talked about the increasing interest of companies in providing users with more and more personalized content. Matías wrapped up the session discussing the important role that the 5G will play in the medium-term evolution of the Internet. 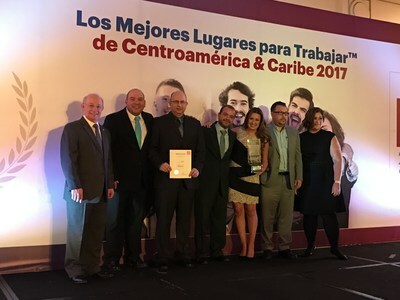 RACINE, Wisconsin, May 4, 2017 /PRNewswire-HISPANIC PR WIRE/ – SC Johnson, maker of trusted brands like Glade®, Raid®, Mr Musculo® and Baygon® today announced SC Johnson Central America has been recognized as the top 2017 Best Multinational Company by the Great Place to Work® Institute. This is the second time the company earned the No. 1 spot in the rankings which includes Costa Rica, Central America and the Caribbean. This is SC Johnson Central America’s 10th consecutive appearance in the ranking. The company was also the No. 1 rated Best Multinational Workplace in 2016. OXFORD, England, Oct. 26, 2016 /PRNewswire-HISPANIC PR WIRE/ –Intrexon Corporation (NYSE: XON), a leader in the engineering and industrialization of biology to improve the quality of life and health of the planet, today announced its wholly owned subsidiary Oxitec has opened its new Friendly™ Aedes mosquito production facility in Piracicaba, Brazil. The new 5,000 m² facility has the capacity to produce 60 million Friendly™ Aedes per week which can help protect up to 3 million people by significantly reducing local populations of the dangerous Aedes aegypti mosquito. Oxitec’s pioneering biological method involves the release of engineered, non-biting male mosquitoes that mate with wild females. The resulting offspring inherit a self-limiting gene preventing them from reaching adulthood and the males themselves die within days providing an eco-friendly solution that solely targets Aedes aegypti and does not persist in the environment. Oxitec will utilize a portion of the new facility’s significant production capability to support its ongoing deployment program in Piracicaba’s downtown area and CECAP/Eldorado district to suppress Aedes aegypti. In conjunction with independent collaborators, Oxitec has conducted five open field trials of its self-limiting mosquitoes in Brazil, Panama and the Cayman Islands. Each trial led to a greater than 90% reduction of the wild Aedes aegypti population, achieving these unparalleled suppression results within six months on average. More recently, Piracicaba’s Epidemiologic Surveillance service released data showing the incidence of dengue had decreased by 91% to just 12 cases in the CECAP/Eldorado district where Friendly™ Aedes mosquitoes were released, compared to a 52% reduction in the rest of the city during the same 12-month period. Notably the public support for the Friendly™ Aedes project has been strong. A survey conducted by the CW7 Market Research Institute in mid-2016 showed that 98% of Piracicaba’s citizens support the use of innovative tools to fight dengue, Zika and chikungunya, and 88% support the use of Friendly™ Aedes. Intrexon Corporation (NYSE: XON) is Powering the Bioindustrial Revolution with Better DNA™ to create biologically-based products that improve the quality of life and the health of the planet. The Company’s integrated technology suite provides its partners across diverse markets with industrial-scale design and development of complex biological systems delivering unprecedented control, quality, function, and performance of living cells. We call our synthetic biology approach Better DNA®, and we invite you to discover more at www.dna.com or follow us on Twitter at @Intrexon. Carib PR Newswire, NEW YORK, NY, Sat. Feb. 26, 2011: Get ready for News Americas, newamericasnow.com. Executives of Hard Beat Communications have rebranded their CaribWorldNews wire to fit the company’s new goal of covering a larger demographic and capturing the emerging interest in the Americas, especially Latin America. NewAmericasNow.com will replace CaribWorldNews.com, though readers will still be able to access the site through domains: CaribWorldNews.com, CaribbeanworldNews.com and Hardbeatnews.com. The company’s new aim is to focus more on the top news, entertainment, business, sports and lifestyle and cuisine of the Americas and the content will be syndicated across over 50 sites and via EBSCO publishing. The brand new website featuring web 3.0 technology will also allow for live feedback from readers who can view a live weather forecast, translate stories to suit their language need, listen to a Caribbean audio newscast right on the site and check out the preview of the latest bold move by HBC executives – a Caribbean entertainment newscast that will be presented weekly by a swimwear-clad anchor. The video cast pioneers a new look and feel in the presentation of Caribbean news that is targeted specifically to the news service’s growing Internet followers globally. Known for their spirit of innovation and originality, HBC CEO Felicia Persaud says 2011 is all about upping the ante – expanding into the Americas while still keeping the sexiness of the beach and the Caribbean’s beauties – with the video news of Caribbean-born celebrities. The V-cast is being produced in collaboration with Mark Wright of Flatbush TV and will feature both male and female hosts. Wardrobe will be provided by popular Caribbean designers, including Guyana’s own, Roger Gary. Persaud added that the company will, however, keep its weekly audio news cast focused on the Caribbean, given the BBC’s pull out from the region. The cast is aired across the U.S. on 13 radio stations and podcasted on 32 African-American and Caribbean websites. For more log on to NewsAmericasNow.com.